With less than three months before the two 2017 United States licensing trade shows take place (SURTEX and International Licensing Expo), there is a significant decrease in the number of exhibitors than at the 2016 shows. The organizer of SURTEX, Emerald Exposition, reported in the press release "SURTEX Welcomes More Than 80 First-Time Exhibitors From Around the World to Launch New Art and Designs" that there were over 250 exhibitors at the 2016 show. However, as of 3/3/17 only 168 exhibitors have applied for a booth at the 2017 show. Previous to the 2008-2009 recession in the United States, SURTEX had a minimum of 300 exhibitors every year. The International Licensing Expo website states that the 2016 show had 489 exhibitors. But as of 3/3/17, only 299 exhibitors are listed for the 2017 show. Unfortunately, the number of exhibitors for both shows has been decreasing each year. And of course, it is not good for their livelihood. Why is there a decrease in exhibitors and how does that impact the shows? Could it signify the eventual demise of them? The following discuss the two licensing shows, the impact on SURTEX because of the dwindling number of licensors (artists/agents) exhibiting at the show, and what artists and agents are doing to find licensees (manufacturers) instead of exhibiting at licensing shows. Licensors (owners of art and designs) exhibit their work at licensing trade shows so that licensees (manufacturers) can view the licensors art for consideration in licensing it for use on their products. Licensing is the process of leasing a legally protected (trademarked or copyrighted) entity – a name, likeness, logo, trademark, graphic design, slogan, signature, character, etc. The previous sentence is from the Licensing Expo website. Even though SURTEX and Licensing Expo are both licensing shows, the emphasis on the type of categories is different. Licensing Expo exhibitors show a wide variety of categories such as Animation, Apparel/Fashion, Art & Design, Automotive, Brands & Trademarks, Characters, Entertainment, Food & Beverage, Sports/Outdoors, etc. SURTEX narrows the categories to artwork, designs, and art brands. SURTEX will be held May 21-23, 2017 at the Javits Center in New York and in conjunction with product trade shows NSS (National Stationery Show) and ICFF (International Contemporary Furniture Fair). Of the 168 exhibitors in the 2017 SURTEX show, 57 are in the Atelier section  and sell all rights to their designs. Thus, only 111 licensors of the 168 exhibitors are licensing art and design. Those include 23 first timers that are exhibiting in the Design District section  and 12 agencies. The cost to exhibit at SURTEX keeps increasing each year. For the 2017 show, the Design District 5 by 10foot booth rental cost is $2700 ($54 per square foot). An 80 square feet (8 by 10 foot) booth cost $4200 ($52.50/sq. ft.) and a 100 square foot booth (10 by 10 foot) costs $5000 ($50/sq. ft.). Show admission is free to qualified art buyers and licensees (manufacturers). Suppliers to the trade and non-exhibiting designers, design studio/agents will be charged $495 in advance and $595 onsite. In the past, SURTEX offered three days of seminars by art licensing experts on the essentials, business, strategies, and trends needed to license art. Unfortunately, no seminars will be offered during the 2017 show. The Atelier section is where textile design studios from around the world sell their surface designs to a multitude of product categories including interior textiles; craft, bedding, and fashion fabrics; wall coverings; and paper. The Design District has small less expensive booths and is available only to first time SURTEX artist exhibitors. Licensing Expo will be held May 23-25, 2017 at the Mandalay Bay Convention Center in Las Vegas, Nevada. After 30 years of holding the show in New York City, the annual June show moved to Las Vegas in 2009 to be able to reduce the show cost. The price of booths or rental of show space for those exhibitors that bring their own booths is not listed on Licensing Expos website but supposedly it is less than if it was held at the Javits Center in New York where SURTEX is held. Although Licensing Expo does have a section for art licensing, its main emphasis is world wide licensing of character/entertainment, collegiate, fashion, sports, and corporate trademarks/brands. And thus, the major attendees at the show are interested in those licensors and not art licensors. Unless art licensors have brands that appeal to the majority of the attendees, it is not cost effective to exhibit at this show. Less than 25 artists and art licensing agents will be exhibiting at the 2017 show. This year the show date was moved from June to May to better fit the timing for the global business cycle. The May 23-25 date for Licensing Expo show does conflict with SURTEX (May 21-23). But this does not seem to be the reason why there are less art licensor exhibitors at the two 2017 shows. Only a hand full of art licensors has been exhibiting at both shows. Registration to attend the Licensing Expo is free (including artists). The show offers over 25 classes related to the licensing industry. Of those classes, only one is specially aimed at licensing art. The fee of $170 grants attendees access to every conference session. For years SURTEX has been a successful way for artists and agents to meet licensees, show them art, and license it. With the increase of artists entering the art licensing industry the competition is great and getting licensing deals is more difficult. Also the retail industry has changed, with products having a short shelf life resulting in less revenue for each deal. Thus, licensors have a lower budget to put towards marketing their work and exhibiting at SURTEX. Note: It is different for the design studios in the Atelier section of the show that sell their designs outright because they earn revenue from their designs up front. Not all the following discussion applies to them. The main reason that many art licensors are no longer exhibiting at SURTEX is because it is no longer cost effective. For most artists and some agencies the increase in cost for a booth, travel and a hotel room besides other incidental costs such as banners of art and decorations for the booth now exceeds the potential revenue that they MAY earn by exhibiting at the show. Many companies have reduced their travel budgets. Before the 2007-2008 recession, several people (art directors, owners, head of product lines, etc.) from each company would walk all three days of the show. Now only one person may attend for one or two days. That means licensees rush through the show and probably miss licensors art that they would have normally viewed and possibly licensed if they had more time. To entice licensors to exhibit, SURTEX offers a first time exhibiting artist a smaller booth at a lower price in the Design District section of the show. If those artists exhibiting in the Design District wish to exhibit at future shows, they will be required to pay the price for a larger booth. However, many of those artists probably will not be able to afford to pay the price for a full booth and will not return. There are over 50 art licensing agencies in the United States and the majority are not exhibiting at SURTEX. Only 12 will be at 2017 show. In the past there were many more agencies exhibiting at SURTEX but the number has steadily declined. For those agencies that have been exhibiting at SURTEX for years, they are looking for new licensees that have not previously attended SURTEX. Agencies are already connected with those licensees that attend year after year and they submit new art to them via the Internet. Even though it is good to meet in person, it can be a waste of time unless the agency has new art to show the licensee. Not enough new companies are attending SURTEX so some agencies have stopped exhibiting because there is not a good enough reason to pay the cost to exhibit. Sadly, SURTEX seems to be in a no win situation. As the number of exhibitors drop because the cost to exhibit for art licensors is not cost effective, the promoter of SURTEX (Emerald Exposition) is forced to increase prices the following year to cover their expenses and make money to put on the show. And because there is less art to view, licensees will eventually stop attending since it is not worth the cost and time. And with fewer licensees attending more licensors will probably stop exhibiting. If the number of exhibitors continues to decline, and it probably will, Emerald Exposition will ultimately discontinue the SURTEX show. Instead of exhibiting at licensing shows, the following are some of what artists and agents are doing to find manufacturers that license art to put on their products. 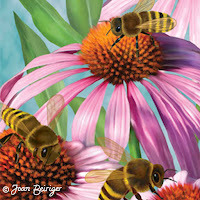 Looking for manufacturers that license art can be very time consuming but is necessary in the art licensing business. Below are a few ideas on finding licensees. – Search the Internet for licensees. Searching by product type can yield lots of companies that can then be researched to see if they use art on their products and do not have in-house designers. If they do not use in-house designers, it is a good possibility that they license art. Viewing the websites of retail chain e-stores is another way to find licensors. Amazon.com is also a good source. – Constantly survey chain and specialty stores to find the names of manufacturers using art on their products. The gift industry licenses a lot of art so checking out gift stores is an excellent way to find manufactures that license art. – Look at advertisements and the sections on "what's new" in gift trade magazines aimed at retailers. Those magazines often show products of manufacturers that license art. Either subscribe to the magazines (some are free) or pick them up at no cost when attending trade shows. The magazine Gifts & Dec is very informative. Other useful magazines can be found on the Internet by searching with the words "retailer gift trade magazines". – Search the Internet for articles that mention manufacturers that license art. For example, read the article "Art Licensing: List of Manufacturers that License Art". Another way to find and connect with licensees is to join ALSC. It is a protected art portfolio hosting website for artists/agents to privately show art to licensees. Licensees can join at no cost. All ALSC members can see examples of art by hundreds of artists but only licensees are allowed to ask portfolio members (artists/agents) for permission to view their portfolios. ALSC portfolio artist and agent members can also connect with the licensee members and share their art portfolios with them. Note: All artists and agents are allowed to join ALSC at no cost but unless they join as a portfolio member they will not be able to share their work with licensees. Learn more about ALSC by going to their website https://artlicensingshow.com/. Walking product wholesale trade shows is a great way to find manufacturers that license art. Manufacturers or distributors that they hire exhibit products at these types of trade shows for retailers to purchase. Often art directors attend the larger shows and many times licensors can make appointments with them to show art for licensing consideration. Note: Retailers/buyers can attend trade shows at no cost but it may be difficult for artists/agents to attend these show unless they have retailer credentials. The gift industry uses a lot of licensed art so that attending gift trade shows is a perfect place to find licensees. The largest gift show in the United States is the Atlanta Gift & Home Furnishings Market that is held each year in January and July. For more information about the show, read "Art Licensing: 2014 Atlanta Gift Show - the amazing Americas Mart campus". This article also has links to two additional articles about the show. Great ways to find licensors is by attending trade shows for other industries besides gifts such as for apparel, sports, tabletop, crafts, stationery, and many more. A list of some of them including gift shows can be found on "Gift Trade Show Calendar" and "2017-2018 Wholesale Trade Gift Shows". Let licensees find you by aggressively marketing licensable art. – Send press releases to product magazines when art has been licensed. – Have a blog and often post interesting and informative articles on it. – Showcase art on social media (Pinterest, Instagram, Facebook, LinkedIn, YouTube). Some licensors have reported getting licensing deals by posting art on Instagram and belonging to LinkedIn they should not depend on only using them to connect with licensees because few art directors have the time to search for art on social media. Also, beware that copyright infringement often occurs when art is posted on social media sites. Fascinating info & some practical advice as well - thanks for posting! Thanks for this very informative article, Joan! Wholesale trade shows have also been dwindling in numbers of exhibitors, and attendee numbers are reportedly down by 40% as well. Similar reasons exist for that decline - online resources exist, travel budgets have been slashed, and the expense is prohibitive. I believe that the face-to-face experience is important and in many ways irreplaceable, but it's a sign of these transitional times. You are so right Carolyn! The San Francisco gift show closed in 2015. However, attendance started climbing at Atlanta Gift show last year and this year it climbed even more. Other shows are also doing well such as the International Contemporary Furniture Fair (at the Javits Center in NY in May). I guess it depends on the type of products and how large the show is to entice attendees. It's really interesting that Atlanta has done so well, and a testament to them finding new ways to be relevant and attract attendees, both as exhibitors and buyers. The whole saga with Emerald Expositions is interesting to watch as they have snapped up smaller shows. It is my understanding that they have also put themselves up for sale. Yes it is interesting and everyone is really happy that the attendance at the Atlanta Gift Show is rising which bodes well for the licensing industry! Emerald is doing well with at least the International Contemporary Furniture Fair that is in conjunction with SURTEX and the National Stationery Show. But having two (SURTEX and National Stationery Show) of the three shows they promote not doing well is not good for their business. And who knows how many of their other shows are failing. I'm not surprised to hear that Emerald is trying to sell their business. what is your opinion regarding the show Blue print that takes place in May also .Is it a good place to find new artists for an agent ? Newbie question here... What are some product magazines that feature already-licensed art? Thanks Joan for another great article. I believe charging non exhibiting artists 495.00 to just walk around Surtex is very idiotic. If an artist or designer would like to walk the show to see how Surtex works, most of them do not want to pay that fee. So what you get is Surtex losing potential exhibitors by not allowing artist and designers to see how Surtex might be a good fit for them. Not too long ago, it was a $40.00 entrance fee for artists and designers to just come in and see what the show was all about. Perhaps Surtex and those that make decisions for Surtex, might want to take a look at how they could make the show more affordable instead of charging high rates of entry. 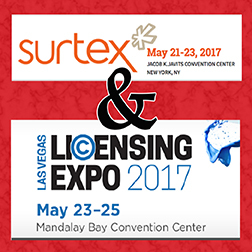 Perhaps Surtex could move to Las Vegas just like the Licensing Show for better rates too. What about having a Rep firm to help get more licensing opportunities? You are right A. Humann that SURTEX is continuing to have their 1/2 hour Trend Theatre educational sessions that is basically for surface design used in home and clothing. But, they have discontinued their ten 1-1/2 hour seminar sessions on all aspects of art licensing for all types of products.